I've designed a linear LED driver, with at least a decent understanding of its pros and cons (mainly the con of power dissipation). The main advantages I'm after is entirely flicker-free operation and relative ease of design. I'm doing this for four channels, so going with something more complex such as a constant current buck converter isn't really feasible; that's also likely above my skill level. 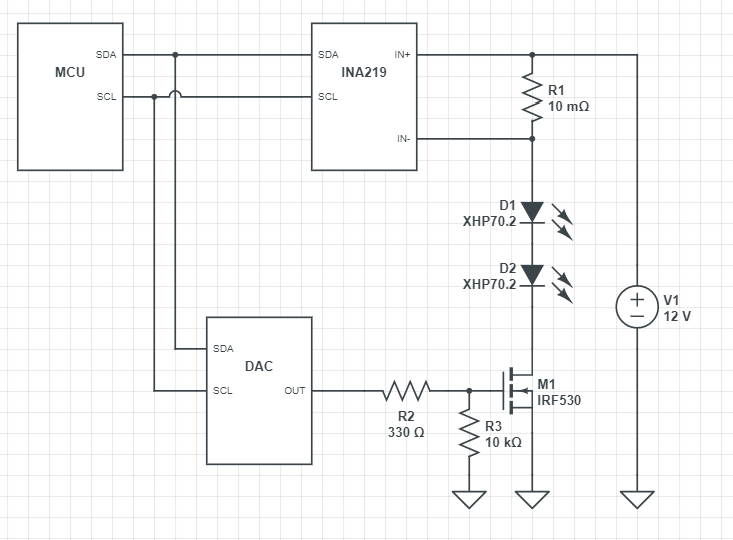 I used a low-side MOSFET(An introductory article about MOSFET: http://www.apogeeweb.net/article/66.html ) to regulate the current; the MOSFET gate is driven by a DAC, and said DAC is controlled by a microcontroller using a PID loop. There's a current shunt on the high side so that the MCU can regulate the MOSFET to get the desired current. Since I want to control this from a 3.3 V MCU, I picked out a MOSFET with a low threshold voltage and low RDS(on) (in case I run out of supply voltage at high currents, and want the entire supply voltage across the load). This all seemed fine to me, until yesterday, when I learned about thermal instability in power MOSFETs. Apparently, my choice of a low RDS(on) MOSFET is a very bad choice when operating in linear mode, as modern "trench" MOSFETs are designed for fast switching only, minimizing time spent not fully on or off, and can fail catastrophically during extended linear-mode operation -- especially at lower gate voltages (such as in my case of <3.3 V at all times). I'm not sure how much this applies to me, since VDS < 12 V and IDS < 5 A at all times, and they will never be very high simultaneously. I expect less than 3.5 W of power dissipation worst-case. After a bit of looking at MOSFETs optimized for linear operation, I could only find ones designed for extreme levels of operation, such as 500-1000 volts at power dissipations of hundreds of watts... and prices of $50 and upwards per MOSFET. Next, I read up a bit on BJTs, but found other drawbacks, most notably the high Vce(sat) voltages that could cause a lot of waste heat during "fully on" operation. I'd also need either a Darlington transistor or some other combination (perhaps a MOSFET driving the BJT base?) to be able to regulate 0-5 A with a <10 mA output DAC. How should I approach this? Should I go with a plain MOSFET, since the drain-source current and voltages will never be high simultaneously, or something else?